After many requests, Peachy Keen has created a Stamp of the Month Club. Each month, members will receive a set worth $39.95 for only $24.95. The club is a 6 Month subscription. This is a GREAT DEAL on fabulous stamps! The new Design Team is sharing their fabulous creations made with the first SOTM. 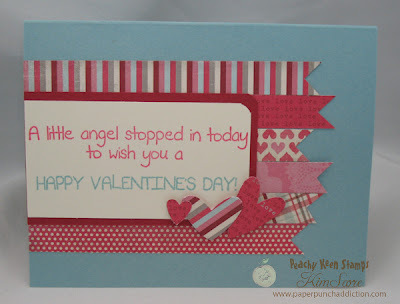 Join the fun in a linky party over at the PKS Challenge Site. The January 2012 set features angels, cherubs, hearts and valentine greetings. This is a HUGE set. The largest stamps in the set are also big. What a great bargain! Details on joining the club are HERE. This is my creation using the new SOTM. These little cherubs are the sweetest! The faces are interchangeable. I wanted to make my little angel sleeping on a cloud. I die cut a bunch of clouds and layered them all over the back with dimensionals. The angel and clouds in front are popped up. The card closes (although it's a big thick). Sorry I didn't have time to write a tutorial for this one. The outside of the card features papers from the Peachy Keen January 2012 Paper Crafting Kit. The kit features a beautiful paper pad, ribbons, tags, pennants and heart clips and embellishments. It's an awesome kit that every paper crafter needs for their Valentine cards! You should take some time to check out the other Design Team projects. They are all truly fabulous! Kim, your angel card is amazing. The clouds are perfect with the angel. What a cute card Kim!!! This is so cute!!! I love how she's in all those clouds! These are both adorable! I love the little angel in the clouds - that is such a clever idea. TFS! What an absolutely fabulous pop-up card!! The little angel really looks like she is floating on the clouds. Great work!! Amazing cards!! Love the banners!! I'm going to buy this paper kit is way cute!! TFS!! Take Care!! Oh Kim, I just love both of your fabulous cards!! Your pop-up card is so creative..
can't wait for the stamps to get here... maybe this will be the year I play along. The little angel in the clouds is so sweet! Just darling! The angel is adorable!!!! Such beautiful work!